Israeli scientists have bred a featherless chicken. Although featherless chickens look quite terrifying, poultry farm owners in many countries have shown keen interest in the birds because they will not need to be plucked. According to the scientists who have bred the new species, these birds cause no harm to people’s heath. Moreover, they grow faster, and their meat is low fat. According to the head of the project, Professor Avigdor Cahaner, at the Agricultural Institute in Rehvot, Israel, such birds have more advantages because there will be no need to install air conditioners for them in warmer countries. However, the genetic scientist admits that the new species of chickens are unlikely to adapt to cold climates. Consequently, breeding bald chicken in Scandinavian countries or Russia would be quite difficult. 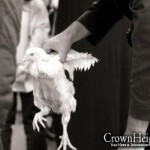 The opponents of the new species have accused the Israeli scientists of having created a genetically modified chicken. But the scientists dismiss these charges and insist that the new chicken comes from a natural breed. Russian experts have found another serious drawback, “When pairing the rooster may injure the hen with its nails and beak because it has no feathers on the head and the neck. Even now, the nails of two of the rooster’s fingers have to be cut off in order to prevent him from injuring the hen. “When pairing the rooster may injure the hen with its nails and beak because it has no feathers on the head and the neck. Even now, the nails of two of the rooster’s fingers have to be cut off in order to prevent him from injuring the hen. But in the case of new breed, there will be scratches left on the hen’s skin, while the rooster will have nothing to hold on to with its beak. This can be quite dangerous for the hen because when other birds see an injured hen they start plucking her. This means that the hen would have to be isolated, treated or culled,” Margarita Dmitrieva said. NOW I CAN CLEARLY SEE THAT THATS WHAT WE EAT FRIDAY NIGHT, Y’KNOW, THE PULKA… AND THE THIGH…;) GROSSSSSSSSS! How does the chicken get flies off its back? How does it cool itself? Clean itself? I know nothing first hand, but it feels so wrong. HOW ABSOLUTELY AND TOTALLY DISGUSTING!! HASHEM CREATED CHICKENS WITH FEATHERS FOR REASONS, HOW AND WHY ARE SCIENTISTS CHANGING G-DS CREATIONS????????????? SERIOUSLY, ITS SICK TO LOOK AT!!!!!!!!!!!! They are naked. Tznius Please! Clearly, this is not a good idea, as these poor chickens will no longer have the feathers protecting their skin. Hashem made those feathers for a good reason. The article indicates that these chicken will be prone to more skin infections. Do they come with a yellow pin? Channa, Have you ever bought kosher chicken…its always full of feathers. I’d personally rather chicken without feathers than to have to pluck chicken that I’m paying top dollar for. Ps. Hashem also created the men developing these sciences! That’s ridiculous. Of course it’s genetic engineering. Everything farmers have done to our food species for thousands of years has been genetic engineering; they’re just doing it the slow way, and now we have better and quicker ways to do it. But face this truth: EVERYTHING WE EAT is genetically engineered. NOTHING we eat is as Hashem made it. Adam Harishon would not have recognised anything in today’s kitchen. #3, WHY SHOULDN”T THEY? WHAT DO YOU THINK FARMERS HAVE BEEN DOING FOR THOUSANDS OF YEARS? DID YOU THINK HASHEM MADE EVERYTHING PERFECT, WITH NO NEED FOR US TO IMPROVE IT?! AND WHY ARE WE SHOUTING? Seriously, the idea that there’s something wrong with genetic engineering, that it’s somehow interfering with Hashem’s creation, is not only stupid but also kefirah. If Hashem didn’t want us to do it, either He would have told us not to, or it wouldn’t work. If it works, and the Torah doesn’t say not to do it, then it’s our job to do it in order to conquer and subdue the world and shape it for our use. LISTEN! Do you hear that? That’s the sound of PETA marching to Israel right now. I’m gonna be sick. But then again, I’m sick of pulling off “peinkes” off my SUPPOSEDLY clean chickens. I could have stuffed a pillow by now. Here’s a million dollar idea. They could breed them to grow fur. The Satmar could eat them and make stremels at the same time. those chickens are so hideous!!!!!!! 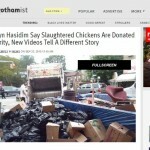 I could see the part of the chicken that Rubashkin sell very clearly!!! To number 3 your 100% prrsent right! We change a lot of things. The world was not created perfect; it is our job to improve it. Would you tell a doctor not to remove appendix if the life of a person depend on the surgery? After all Hashem created us with appendix for reason? What about haircuts or earrings? Let’s go even further, if Hashem created us the way we should be, why do we have to circumcise our boychicks? Your argument fits perfectly into what all those who refused bris are saying. Now having said that they do look ugly. But the chicken with feathers in a soup looks even uglier. They, the scientist are doing it for us. Trafe chickens do not have the feathers. Also this is old news, at least 2-3 years old, at least. tsar baalei chayim. cruel. I’d rather clean messy feathers than to think that an animal walked around getting scratched up from every leaf that falls on it , and worse. awful. Chana, Hashem also created various diseases. If it’s not “changing G-d’s creations” for scientists to develop cures for those, then neither is it “disgusting” if they do the same with other areas of G-d’s world. “Asher bara Elokim laasos – lesakein”: G-d created the world, it’s our job to make it more perfect. This Idea is so DISGUSTING please let me know when its on the market since I will not want to purchase this type of food. While I agree with you, this is disgusting; if someone else sees value in this and it doesn’t impact our lifestyle, then we have the option to look the other way. Who are we to pass judgement on someone doing something they feel is adding value to their life. Until now one had to ask a Rov if a chicken is kosher after it was shechted. Now one needs to ask a rov if such a chicken is kosher due to the possible Tzar baalei chayim involved. looks as if there mother got injection of some sort of drug . why cant they breed harmless arabs? btw you think the eda haradedith will allow them for kaporos unless they will dresws up! Kind of makes my stomach turn. Seems just wrong. Gross and very sad!!! How are the poor birds going to keep warm and cool without their feathers? What about flapping around as all birds love to do? Is this what scientists are putting their efforts into? Puhleeze! Give us a cure for the common cold–naked chickens we don’t need. I have friends who can knit; I wonder if there’s a market for chicken sweaters. If it wasn’t so difficult, I would be a vegetarian in a flash. I think the way humans treat the animals we eat is tzaar baalei chayim. There’s no chiyuv to eat meat today if you don’t enjoy it. G-d created diseased, how and why are doctors curing them? G-d created the world with opportunity and room for growth, in a way that we can become partners with Him. They are not creating new entities, rather exploring. A note to PETA…. stop throwing paint and holding demonstrations. Get Israeli scientists to start making all animals look like the food we eat or the clothing we wear, I for one will never eat another chicken, that is one stop in their direction! #32, what has tzaar baalei chayim got to do with kashrus? There is no shayla, it’s 100% kosher. Those chickens are so cool. They look like really awesome science experiments. very creepy, but still awesome looking. Finally! I cant tell you how many nights this feather issue has prevented me from sleeping. this chicken is a NATURAL breed. YES it happens that a chicken is NATURALLY born COMPLETELY without the “feather gene” (call it a sickness a mutation a blessing or wtvr – JUST NOT TZAR BA’ALEI CHAYIM -) now if this chicken pairs with another chicken that is missing the “feather gene” COMPLETELY too, then you have succesfully and naturally created a breed of chickens that will not be able to grow feathers, SO LONG as they are only paired with other featherless chickens. i.e if you pair a featherless chicken with a regular one you will have a 50% chance it will have feathers and 50% it wont. keeping the featherless chickens breeding with one another only ensures the feather gene isnt introduced back. Would make a shmorgas board out of this one! You are all a bunch of idiots. This is the best thing since sliced bread. Chickens with no feathers if only they could make them skinless. Hashem knew what he was doing when he made them with feathers. PUT THEM BACK ON! YUCK! I mean, come on, there are sooo many diseases to be cured! #43, that’s how genetic engineering has traditionally been done. Nowadays we have quicker and more efficient methods to achieve the same thing, but there’s no real difference in the result. It is extremely disgusting. There is nothing wrong to genetically modify to help people. Here all they are doing is to kerning with the chicken so the processor has mo trouble removing feathers. Feathers help a chicken live the average 48 days of its life. Removing them would make those days a horror. anybody against this obviously has never eaten chicken in israel, let alone prepare chicken in israel. it might be a very good solution! :) hearty appetite! Number 19, if you think David Elliot chickens are feathery, you are invited to the Holy Land where the two Lubavitcher shechitas – Of Anash and Lifshitz have a contest to see who will leave huge feathers on their chicken without losing clientele. Gross is an understatement,and for me it is a distinct pleasure to be in CH and cook chickens with very little bother! And if the two owners read English and read this and it moves them to act on this, yehei ze s’chori. The Pulka dances the Polka! Chickens are nothing today like they used to be in y’mei bereishis, they are merely a flightless domesticated version, bred by human beings to be the way they are so they taste good and produce the best poultry possible (Except for the defeathering problem what a pain!). It’s completely “man made”. only someone incredibly stupid would say “if it works and isnt prohibited then we should do it”!! HAVE YOU EVER BEEN INTRODUCED TO THE CONCEPT OF RIGHT AND WRONG??? Last I checked, if i have a gun, and it works, and i pull the trigger, AND IT WORKS, then G-d wanted me to kill someone. people have the ability to take what was created, and improve on it OR THEY CAN WREAK HAVOC AND DESTRUCTION!!!!. But i guess thats ok with all your lazy butts bec then you wont have to pluck feathers….. The skin will probably be a slightly different texture when cooked, as there are no pores from feathers. In addition the skin will be much dirtier and darker, thus although the chickens will make life easier for the producers by eliminating the de-feathering process, it will discourage consumers from purchasing the product. I also think it’s gross – but it may be economically and environmentally better. But honestly, how often do you see a live chicken? Most of us buy chickens that are already plucked and quartered in those shrink-wrapped yellow trays. We have lost the realization that this is a live creature. If we did, we would eat meat with much more reverence. BTW, I think it is illegal to sell chicken in Canada with any feathers. The only reason the kosher manufacturers here do it is because WE LET them. #57, you’re arguing against a strawman. There is indeed a prohibition against pulling the trigger and taking someone’s life, right? To #56: good point. However, Shulchan Aruch (Yoreh De’ah 59:2) says that if all of a bird’s feathers fell out because it was very fat, then it’s still kosher. Conceivably, then, something similar would apply here, where the chicken was born without the gene for feather development. You’re right, though, that this is surely a good subject for a shaalah. #56, you’re wrong. Stand corrected. #57, in case you didn’t notice, Hashem prohibited murder. He didn’t prohibit genetic engineering. #58, exactly. And so is EVERY plant and animal that we use for food. People don’t realise this. Most people would be surprised to know that the sweet orange carrots we eat did not exist until the 17th century! They were deliberately bred by people. $54 The Baal Shem Tov would sharpen his chalaf with tears, but what has that got to do with the subject? Did you imagine that he was crying for the poor animals that he was shechting?! Yes, in Canada the law requires all feathers to be removed from the chicken, so the Canadian kosher chickens are indeed much cleaner than American ones, let alone Israeli ones. But they do this by hand, and therefore it costs more. If you’re willing to pay the extra money for clean chickens, you can buy Canadian chickens in America. And if there’s a demand for clean chickens in EY at a premium price then someone will provide them; but don’t expect them to be cheap, because someone has to be paid to remove the feathers one at a time, by hand, as they do them in Canada. Milhouse, I would expect you to know better. Artificial (laboratory) genetically modified breeds of animals and plants are extremely dangerous to consume. There is volumous research demonstrating this. L’fi aniyas daiti, they use a ‘binder’ to get the engineered gene to ‘bind’ to the existing dna, and when consumed, this ‘binder’ can ‘bind’ to one’s own dna (yes it can), and allow for foreign content to bind to one’s own dna, which can lead to great harm (tumors etc) in the person, and possibly their off-spring. Additionally, as each gene multi-tasks, artificially forced gene modifications can change any number of things in addition to the desired change, which can have any affect on the breed itself as well as those who consume it (even if it’s just illness causing via consumption. There is much that can be researched on this subject. I recommend it. Footnote: Yaakov Avinu genetically engineered lavan’s flock (spotted, striped etc). This is ‘natural’ engineering, vis a vis ‘artificial’ (faster more dangerous) engineering which can affect great harm. These chickens are not artificially genetically engineered, they are naturally engineered. #65, you’re a liar. There is NO research demonstrating that genetically modified breeds are dangerous, let alone “volumous” whatever that means. Only an idiot would think that they are dangerous. Your “daas” is indeed very “oni”. Your theory makes no sense. And there’s no advantage to natural anything over artificial anything. On the contrary, when something happens naturally it’s not tailored to achieve the result we want, so it’s MORE likely to have unwanted side effects. When we deliberately achieve a result we go straight for what we want, so there’s less (though far from zero) chance of unintended consequences. #67 Strawberries as we know them didn’t even exist until 200 years ago. They’re a cross, created in Europe, between a North American species and a South American one! The Malbim says that even Noach had domesticated animals that were different from their wild cousins, and those were the extra animals he took on to the teivah so that the 1600 years of work that had gone into breeding them should not be lost. Why does this appear only in “Voice of Russia?” Not one news source in EY or anywhere else carried it. I lived in Russia for many years after Communism fell and I still live in the FSU. I rarely even bothered reading the local papers because anyone can buy an article in any one of them for any reason (sort of like the frum publications but worse because the Russian press allows purchasers to place derogatory articles about business or political competitors). Until I see it elsewhere, I have no choice to believe that this is a prank or a report based on a couple of mutants that were born but will not ever be bred. So T. rex was a bird not a reptile? And we cry “Animal Cruelty” when some indigenous cultures slaughter chickens in suburbian kitchens for a family supper while yet we legalize such vicious acts against creation all in the name of science. This is sick, people, do you not see? Interesting how everyone gets offended by this image, yet are not bothered by the de-beaking, incarceration in tight battery cages, decapitation, electrocution, and steamming of these beautiful beings. If you’re not Vegan, you should shut your trap about this. And no, Kosher does not mean the animal is treated any better. You shouldn’t eat dead animals. Repeat that to yourselves, and between repetitions, think about that statement. All of you defending GMOs because you think we have always done that to species are absolutely ignorant of what a GMO is, what a cultivar is and what a sport is in the breeding sciences. When you go research the differences of selective breeding vs crossing KINGDOMS and other GMO horrors, then come back and argue in their favor. Until then, shut up. You sound insanely stupid. If this bird is a GMO, then consumers have a right to know. If it is not a GMO then consumers need to start asking themselves WHY they would allow such a thing to be bred to exist. As a poultry and waterfowl farmer I am APPALLED but this bird and understand many implications of it: the top being it is ONLY about saving a few pennies per bird in the plucking part of the slaughter. As usual, greed outweighs our livestock animal’s quality of life. The amount of damage, discomfort and harm that comes of farming featherless avian species is too horrible to even consider. Their natural behaviors are altered. Such as preening; a sanitary and self comforting action for birds. And wings are meant to be exercised with flapping and having the air putting pressure against the feathers- developing chest and breast muscles. The term “pecking order” comes from the poultry industry for a reason! They peck on each other for status. Feathers are their protection. All I see in this poor creature is our continued inhumane treatment of animals and placing profit above the simplest of kindness; allowing birds their feathers. I am not a religious person, but NO God or Hashem or Allah created animals like this. Only man can do something this barbaric.